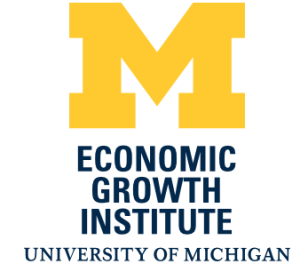 The U.S. Commerce Department’s National Institute of Standards and Technology (NIST) selected the University of Michigan’s Economic Growth Institute to study successful technology commercialization practices at public doctoral universities. The NIST-funded study explores the technology partnerships at universities that have received the Association of Public and Land-grant Universities (APLU) Innovation and Economic Prosperity (IEP) Universities designation. The IEP designation recognizes institutions for their contributions to regional economic development. 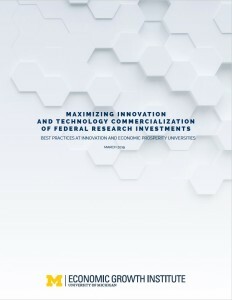 The study interviewed 51 faculty researchers, surveyed 200 individuals, and spoke with dozens more on topics in innovation commercialization and university best practices. Contributors to the study included research faculty, vice presidents of research, and technology transfer staff members, among others. The research team identified best practices in four main categories: culture, champions, incentives, and collaboration. The result is a set of practices that can be adopted and expanded to further drive innovation and economic engagement at universities and federal research labs. The executive summary is available for download at the link below. To receive the full report, please complete the form.